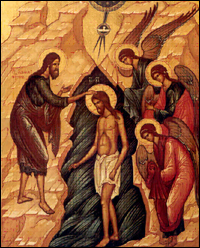 On a par with Pascha, the feast of the Baptism of our Lord is one of the oldest Christian holidays. It is dedicated to the baptism of our Lord Jesus Christ in the River Jordan. From ancient times this holiday was celebrated by Christians with great enthusiasm, because it reminded them of their own baptism and promoted within them a deeper awareness of the power of this sacrament. The event itself of the baptism of our Lord was as follows: when the time came for the Lord Jesus Christ to embark upon His public service, God sent the prophet John the Baptist to preach repentance, in order to prepare the Jewish people for the coming Messiah. According to the holy Evangelist Luke, John the Baptist began preaching in the 15th year of the rule of the Roman Emperor Tiberias. This was approximately in the 779th year from the founding of Rome or the 30th year of the Christian era. At that time the Lord Jesus Christ was still living in His city of Nazareth, in the northern part of the Holy Land – the region called Galilee, where the Holy Family settled since the time of the massacre of the Bethlehem infants by Herod. John the Baptist’s teaching was simple, but it penetrated the very soul of his listeners: “Repent ye, for the Kingdom of Heaven is at hand,” – said the prophet. The site of John’s preaching was the Judean wilderness – the sparsely populated area comprising the western shores of Jordan and the Dead Sea, dotted with rocky hills and dried up streams, with very sparse vegetation, which is why it was called a wilderness. The prophet John, son of the righteous Zacharias and Elizabeth, became orphaned very early and grew up in this wilderness. There he became accustomed to an extremely harsh way of life. He wore a garment made out of camel’s hair, girdled with a leather belt, and ate locusts and wild honey. After the boring sermons of the Jewish scribes, discoursing primarily on the correct performance of various religious rites, the preaching of John the Baptist swept the entire Judea as a breath of fresh air. The inhabitants of Jerusalem, Judea, and even Galilee and Samaria thronged to him to hear the living and inspired words of this prophet of God. With his appeal for repentance the prophet John impressed upon the Jews the need to profoundly realize the error of their ways, to condemn their sinful life, and to begin a new one based upon God’s commandments. The word “repent” – metanoin in Greek – means “to change one’s worldview,” to look upon life in a new way. Moreover, the prophet John insisted upon the repentance being sincere, wholehearted, and accompanied by self-correction and good deeds. “Bear fruit worthy of repentance,” – the prophet told the Jews. To the frequently asked question “what to do?” the prophet replied: “Whoever has two pieces of clothing, give to the one who has not”– in other words, do good and help the needy. The publicans (tax collectors) the prophet persuaded not to extort more taxes than was legally required. The soldiers he taught not to offend anyone, not to slander anyone, and to be content with their earnings. However, the ones who repented and confessed (i.e. openly declared) their sins, the prophet John baptized in the River Jordan. The baptism consisted of the repentant’s prayerful immersion in water, which symbolized the cleansing of sins. The prophet John’s baptism was not yet the grace-filled Christian baptism, but a preparation for it. In calling the forthcoming Kingdom of the Messiah a heavenly one, the prophet John gave to understand that the Messianic kingdom would not be what many Jews incorrectly imagined it to be – a powerful and rich state. In reality, the Kingdom of the Messiah would be heavenly and spiritual, summoning people to God and granting them moral renewal. Looking at John, some of the Jews asked themselves whether it was he who was the awaited Messiah? But the prophet John decisively declined such an honor, explaining to them that his task was only to prepare people for the coming Messiah. He, John, was baptizing them in water as a sign of repentance, while the Messiah would baptize them “with the holy spirit and fire.” In other words, the new baptism would not simply be a symbolic cleansing like John’s baptism, but would be a grace-filled renaissance of the person. In the Messianic baptism the Holy Spirit Himself, acting as fire, would burn away people’s sinful impurity and would kindle within their hearts an ardent desire to serve God. Those who accept the Messiah will be gathered by God into His Kingdom, like wheat is gathered into a granary, while those who oppose Christ will be burned by God like straw in an inextinguishable fire. The Evangelists continue their narrative by saying that “then” – during one of John the Baptist’s sermons on the shores of the River Jordan – “cometh Jesus from Galilee to Jordan unto John, to be baptized of him.” Why did the sinless Jesus come to be baptized? The answer to this question we receive from John the Baptist himself, who several times before this event explained to the members of the Sanhedrin (the Jewish supreme religious council): “For this I have come to baptize with water, in order that He (Christ) be made manifest to Israel,” in other words, that the baptism reveal who He really is. Up to that time Jesus Christ lived in the solitude of Nazareth, known only to the inhabitants of his small hometown as the son of Mary and the carpenter Joseph. Now Christ had reached the age of thirty and, according to Jewish law, received the right to instruct people and call Himself a “rabbi” – teacher. The time had come for Him to reveal Himself to the people, and for the people to hear witness of Him as the long-awaited Messiah. This is what happened now on the shores of Jordan. However, when the Lord approached John, the latter sensed His great and divine holiness, and he said to Jesus: “I have need to be baptized of Thee, and comes Thou to me?” To this the Lord replied: “Suffer it to be so now, for thus it becometh us to fulfill all righteousness.” By the word righteousness Jesus Christ means the will of God. It was the will of God that all who wished to become members of the grace-filled Messianic Kingdom should be baptized. Baptism took on the meaning of a “door” into the Kingdom of God. As the progenitor of the new mankind that was restored by Him, Jesus Christ was due to enter first into the Kingdom which He was establishing, to open the way to salvation for people, and to teach them to fulfill the will of God. Simultaneously, the Saviour’s immersion in water at the moment of His baptism also had the aim to sanctify baptism, to turn this symbolic rite into a grace-filled, restorative Christian sacrament. All those who came to John first confessed their sins and then immersed themselves in the water. Jesus alone, being sinless, came to John to be directly baptized. After being baptized, Jesus came out of the water immediately and began praying on the shore. At this point He, as the Son of God, was asking His Heavenly Father to bless the beginning of His public service. Suddenly, while Jesus was still praying, the heavens opened and the Holy Spirit descended upon Jesus from there in the form of a white dove. At the same time the voice of God the Father was heard from there, saying: “This is My beloved Son, in Whom I am well-pleased.” These words of God the Father were an indication to John and all the people present of the Divine dignity of the Messiah, Who was not only a Man, but also the Only-begotten Son of God. The triple miracle which took place here – the opening of the heavens, the descent of the Holy Spirit in the form of a dove, and the witness of God the Father – fully convinced the prophet John that Jesus Christ was indeed the awaited Messiah. The prophet John was actually waiting for this visible descent of the Holy Spirit upon the Messiah, because in the very beginning, sending the prophet out to preach, God had said to him: “Upon whomever thou seest the Spirit descend and remain upon Him, He is the one Who shall baptize with the Holy Spirit.” Thus, from this time on, John the Baptist unhesitatingly bore witness to all about Jesus being the Messiah and the Lamb of God Who had taken upon Himself the sins of the world. Soon after the Lord Jesus Christ’s baptism, the prophet John ceded to Him several of his own disciples: the brothers Andrew (the First-called) and Peter, and the brothers James and John (the Theologian). Adhering to the Saviour, they became His first disciples and apostles.